The organizers of a controversial 2007 Moscow art exhibit have been convicted of inciting religious hatred and heavily fined, but managed to avoid a possible three-year prison term, Kasparov.ru reports. The Tagansky District Court in Moscow handed down its verdict in the high-profile case Monday morning, ordering exhibit curator Andrei Yerofeyev and former Andrei Sakharov Museum director Yury Samodurov to pay out the equivalents of $6500 and $4900 respectively. The two were sued by the ultra-right Russian Orthodox organization People’s Assembly for organizing the exhibit “Forbidden Art – 2006,” which included works that the group claimed were criminally offensive. State prosecutors requested a three-year jail sentence for each of the organizers. According to the verdict, Yerofeyev and Samodurov are guilty of acting in a way that was “directed at the fomentation of hatred and enmity through the use of religious imagery.” The court called the plans for the exhibit “a deliberate crime” that the two men were able to consciously plan out due to their professional knowledge of art. The judgment cited testimony from People’s Assembly activists and other Russian Orthodox followers who spoke on behalf of the prosecution, claiming that the exhibit “foments hatred towards the Orthodox Church on the whole and Christianity in particular.” They also asserted that the works had no artistic value. Notably, of the 134 witnesses for the prosecution, only three had actually visited the exhibit. At the same time, the court declared that evidence given by specialists speaking for the defense was unscientific and refused to take it under consideration. Testimony from artists, art historians, critics, and journalists speaking for the defense was cited in the court decision only in small fragments. On the whole, the court claimed that testimonies for the defense didn’t hold water. Both the exhibit organizers and People’s Assembly activists say they play to appeal the decision. The ruling elicited scathing disapproval from Orthodox activists, who stood outside Tagansky Court late into the evening on Monday shouting “disgrace!” A state prosecutor declined to comment on whether or not they were indeed planning to appeal. Before the beginning of Monday’s session, members of the activist art group Voina released 3500 cockroaches into the halls of the courtroom in a sign of support for the defendants. Two activists were detained as a result. This is not Yury Samodurov’s first conviction of inciting religious hatred for showing works of art. 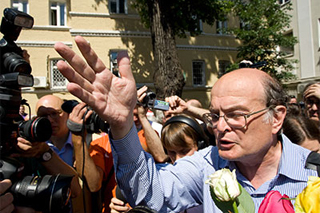 In March 2005, the then-director of the Andrei Sakharov Museum and Public Center was convicted on these grounds as a result of organizing an exhibit entitled “Careful, Religion!” Then, as now, prosecutors asked for a three year prison term, but Samodurov was only faced to pay a fine of approximately $3225. A photo essay of “Forbidden Art – 2006” is available in Russian by clicking here. The first set of five pictures explains how the exhibit was set up: Viewers enter a room with blank white walls, and as the art is hidden behind the walls, viewers must peek through small holes to view the works in fragmented form. As the Sakharov Museum’s website explains, the paintings are among those that were banned by various Moscow museums and galleries throughout the year 2006. “The goal is to monitor and discuss the character and tendency for institutional censorship in the cultural domain,” says the site. The exhibition was held from March 7 – 31, 2007.